"A veritable muusical feast" "Production hit a high note"
"Sparkling Night with the Knighton..."
"Adventurous choices and an agile performance..."
"A solid performance and wonderful music..."
"An unusually close encounter, with much joyful energy..."
"A great night out in Leicester"
The Knighton Chamber Orchestra have just done it again - given us, in their latest concert, an evening that was entertaining, instructive and, above all, moving. Butterworth's "Banks of Green Willow," reminded us again of what was senselessly lost in the First World War. Brahms fouth completed Paul Jenkins's symphony cycle, and the way the orchestra captured the opening's restless intensity and also gave shape and meaning to the final passacaglia convinced that this was the best of the group. I mentioned moving earlier. If music fails to do this something is missing and the heart of this concert was Francois Salignat's performance of Ravel's piano Concerto, its opening beautifully integrated here by the woodwind, and his interpretation of the second movement was almost heart-stopping. This was Francois's seventh concert in Leicester. He must like us. He gave us Ravel's "Jeux d'eau," as a parting gift. Make sure that was only "au revoir," Francois. I recently had a most enjoyable, even adventurous, evening as a member of the audience of Concerto, presented by the Univeristy of Leicester in the Fraser Noble Hall, London Road. What made the evening special was that we didn't just watch but also took part in the production. Its devisors and actors, Ryan O'Shea and Katt Perry, arranged for us to eat apples, beat time with pencils, even shred musical scores, which gave us a feeling of dislocated engagement, as if we were in the war itself, when you never knew what would happen next. We were constantly engaged but put on our guard at the same time, like the need in wartime to be constantly alert. Though, unlike being in a war, our invitations to take part were gently and stylishly done by Ryan and Katt, so that our acceptance made the evening an enjoyable participation. The actors, guided by Michael Pinchbeck's writing, gave us Ravel's biography in all its lyrical poetry of the lost. At the play's centre was Ravel's music, especially the Piano Concerto for the Left Hand. This was magnificently played by Nicholas McCarthy, a professional one-handed player. The University of Leicester Orchestra and Knighon Chamber Orchestra revealed hte innovation of Ravel's music, with its swirls and dwellings, advances and retreats from compositions before the war and how it embraced the jazz age afterwards. The evening was inified by the most able conducting of Paul Jenkins, who brought the orchestra together with actors and pianist to blend the moods, at times strong and deperate, at other times playful and relaxed. As an encore, the orchestra treated us to Bolero, a familiar climax to an otherwise experimental but satisfying evening. It was a real privilidge to attend the concert by the Knighton Chamber Orchestra on Saturday September 10, at Fraser Noble Hall, Leicester. The hall was full-a reflection of the reputation that this orchestra has built up, unerder the capable direction of Paul Jenkins. They started with a concertino for tuba and strings by Arthur Franckenpohl. In spite of being a composer unknown to most audiences, this turned out to be an approachable work-plenty of geniality and jokey moments with some seious-sounding stuff in the slow movement. I last heard the second work, Peter and the Wolf, in about 1962, in South-East London, with Alvar Liddel, the wartime newscaster, who read the narration. It was sombre and accurate-but not fun. The Knighton Chamber Orchestra's performance was alive. The orchestra playing gave real life to the musical portraits. Andrew Radford, narrating, realy drew you into the story. The master stroke was to have a group of children acting out the story simultaneeously as the bird, the wolf, Peter, the hunters, the duck and the cat. We loved it. But the main work was yet to come. After the interval, a young woman came forth, along with the orchestra playing the Shostakovich Violin Concerto No 1. This must be one of the heaviest and most difficult works in the violin repertoire. 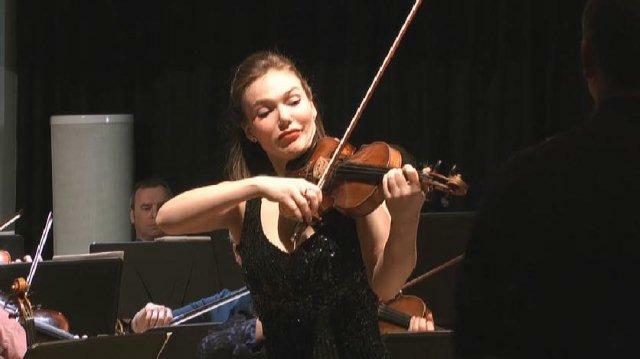 The soloist, Fenella Humphreys, not only played it, but played it superbly. I am sure that many in the audience were, like me, on the edge of their seats during the last movement, and many stood in their applause at the end. At a concert by Knighton Chamber Orchestra, Moritz Wagner won the plaudits of a large audience at the Fraser Noble Hall, Leicester. This young man demonstrated great sensitivity in his performance of Mozart's well-known D minor piano conerto. Moritz has the consummate ability to make lyrical passages memorable without over-sentimentalising them. At the same time, he relishes the bravura passage at the start of the third movement. This is a Leicester pianist to make us proud and who will, I have no doubt, become the toast of this city should he persevere in the hard work necessary to pursue this very strenuous career. Under the guidance of meistro Paul Jenkins and supported by the fine musicians of Knighton Chamber Orchestra, Leicester is given teh opportunity to hear fine music. The next concert by the orchestra will be pn Saturday, September 30th, at fraser Noble Hall. Amid the ornate decor of the Fraser Noble Hall on Saturday evening there was a splended concert by Knighton Chamber Orchestra under the capable baton of Paul Jenkins. The musicians started with the Overture Semiramide by Rossini in tribute to Ranieri's Italy and the triumph of Leicester City in the Premier League. This was followed by Mozart's Haffner Symphony. Leicester has a lot more to be proud of than its football team: two youngsters who without doubt hvae fine careers ahead of them enthralled the aidience in the second half. Tom Barton, soloist in the Chaminade Concertino for flute, performaed with great delicacy and verve. The highlight of the evening was a tour de force by the prodigiously talented Moritz Wagner, who conjured up a gamut of emotions as the soloist in the Shostakovitch Piano Concerto Number 2. The orchestra and pianist worked in blissful harmony to create a truely memorable interpretation of this lovely piece of music. Leicester is assured a bright future if hte talent that wa on display here continues to thrive. 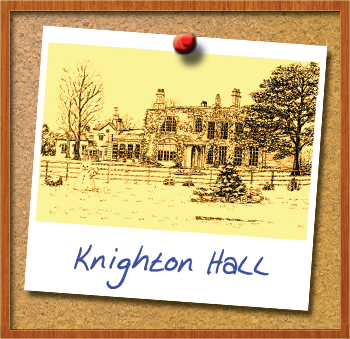 A CONCERT was given by the Knighton Chamber Orchestra in the Fraser Noble Hall, Leicester on Saturday January 23rd, 2016. It was a full hall for a musical feast-from The Gladiators to Beethoven, with not just one but two , Prokofiev concertos. The brass were splendidly brazen for The Entrance of the Gladiators, by Fucik and had wonderful moments in Beethoven's 8th Symphony sa well as the two concertos by Prokofiev. Fine woodwind playing, especially from the principal bassoon was complimented by skiful horn-playing in the Prokofiev piano concerto. The highlight of the evening was undoubtedly teh 3rd Prokofiev piano concerto. Conductor Paul Jenkins and the Knighton Chamber Orchestra must have worked very hard with the intricate orchestration which partnered Francois Salignat's amazing, tender, brilliant and virtuosic piano playing. Earlier, Anne Mee, leader of the orchestra's cello section, performed the Prokofiev cello concertino. It was a veritable musical treat, concluding with and encore; Anne Mee played the delightful Faure Siciliano, sinsitively accompanied by M Salignat. David and Sarah Clark, Leicester. I write as a member of the audience who saw Knighton Opera's production of Eugene Onegin (October, 1, 2 and 4th at the Fraser Noble Hall). The orchestra, chorus and soloists performed with relish. There was forceful and committed playing from the Knighton Chamber Orchestra, unforced merriment from the chorus, and the principal singers sustained the drama of Tchaikovsky's music. Chris Marlow's Onegin was imbued with haughty charisma; Alexander Anderson-Hall aroused sympathy as the man whose life was spinning out of control, and Michelle Carlin's passionate singing convinced us that, although a man's name forms the title, the music tells us that this is Tatiana's opera. The dancers added splendour. There were many subtlties in the imaginative production, including delivery of the letter and the duel. The best way of thanking Paul Jenkins and his fellow performers is to quote from the orchestra's President , VladimirAshkenazy: "The British tradition of community music making is unique; it contributes in so small way to keeping music alive in this country." A Feast of colour, melody and movement might be the best way to characterise an ambitious production of Bizet’s Carmen performed by Knighton Opera conducted by Paul Jenkins and directed by James Ward at the Richard Attenborough Centre on October 3rd, 2014. I attended the second performance of this triple-run. The limited space of the RAC was used imaginatively by performing in the round. Don Jose, sung by tenor Alexander Anderson-Hall, passionately handled Bizet’s demands. Carmen (mezzo-soprano Nicky Bingham) had an impressive stage presence: she not only had to sing beautifully, but act and dance the “seguidilla” (with castanets! ), which she executed with seductive delight. Michaela (soprano Michelle Carlin) sang with ravishing clarity and style. Escamillo (Chris Marlow) dominated his scenes with fiery sexuality accomplished well by his ringing baritone. Stephen Foster’s sonorous bass was excellently cast as the commanding officer. There were many other smaller parts, all performed with vivacity and skill, and the chorus members sang zestily. The production managed to make the very best use of the open space and the gallery; and using the barest minimum of props and different costumes, we in the audience were easily able to follow the plot. A huge amount of work must have gone into achieving this most popular of operas - and it was well worth it. What a pity a lot of Leicester missed a wonderful concert at Embrace Arts at the Richard Attenborough Center. There is so much music going on in Leicester that sparse audience on Friday night was depleted, no doubt, by attendances at other venues. But they missed a treat. Paul Jenkins, as usual, coaxed an excellent performance out of Knighton Chamber Orchestra (KCO) in a concert which included Leonore 3, Beethoven's third attempt out of four to write an overture to Fidelio, and Bach's Flute Suite No 2, the one that contains the famous Badinerie. The jewel in the crown was the final piece, Brahms's 2nd Piano Concerto, played by international concert pianist Francois Salignat. His playing was majestic, absorbing and scintillating. It was a pity about the piano - it was not equal to his talent. The KCO are next at the Fraser Nobel Hall on March 29. Don't Miss them.You will not be disappointed. "Well done Leicester! Or more precisely, well done Knighton Chamber Orchestra's director, Paul Jenkins for giving us a wonderful two-part evening's entertainment on Saturday 19 January 2013 in the Richard Attenborough Centre. What an exciting innovation to (1) show Le Concert; a French film based on the Phoenix-like return to maestro status of a former Russian world famous orchestral conductor. His fantastic career was publicly broken during a performance of Tchaikovsky's Violin Concerto for defending Jewish musicians. And (2) to follow this most entertaining film with an amazing concert, culminating in a stunning performance of Tchaikovsky's Violin Concerto. Such a seemingly good idea could have so miserably failed, given that much of the concerto had been performed at a very high professional level during the film. But, of course, Paul was not to let such a possibility happen. Firstly, he organised the programme to start with two Mozart pieces: the Overture to The Marriage of Figaro and his Symphony No 40 in G Minor K550 and thus swept our thoughts away from Tchaikovsky and secondly and goodness knows how he arranged for the exceptionally gifted and internationally renowned violinist, Tamsin Waley-Cohen to take the lead role. Her rendition was superbly dramatic and yet so emotionally open and enveloping that it was as if the audience had become one sentient entity we were truly transfixed. Of course, even with Tamsin's performance, the evening would not have gone well if the orchestra had not also been up to the mark. As ever, KCO's performance did not let their guest performer, or the audience down. We are very lucky to have such amateur musicians in our county and I think it behoves us to publicly recognise the pleasure they afford us. Thank you KCO for such a great night out!" "A first for the Knighton Chamber Orchestra - a performance of music by Shostakovich; in this case his Cello Concerto No. 1. Conductor Paul Jenkins introduced the piece with a demonstration of some of the textures used by the composer. The sound of the orchestra in this often tormented work had a particularly spatial and effective quality, the tonality of the piece and effective layout of the musicians contributing significantly. Local cello soloist Anne Mee gave a good account of the piece, injecting energy and passion into her fine performance of a technically demanding part. Young international pianist Francois Salignat was the soloist in Mozart's piano concerto No 20 in D minor, giving a performance full of poise and dignity. The piece shares the drama of the Shostakovich, but in a more palatable and polite way. It was a performance full of energy and warmth, which really enveloped the listener. To round off the first half two soloists joined forces in a beautiful rendition of The Swan by Saint-Saens. Perhaps the most joyful drama of the evening was left to Beethoven. His Symphony No. 4 in B flat major presents a series of melodic themes. Played with enthusiasm and skill, I particularly liked the Adagio with its light and airy tonality and the final Allegro which had a particularly happy feel. An evening of fine music from this ambitious local orchestra." "When Danish composer Carl Nielson essayed writing a concerto each for the members of Copenhagen Wind Quintet, he set out to delineate the characters not just of the instrument but of the instrumentalist. In the event he was to produce only two concertos of the five for clarinet and the work that opened this concert, for flute concerto. Here a bass trombone disports itself, mocking the flute. Dana Morgan relished each turn of phrase and mood in the demanding flute solo. Next Francois Salignat gave a commanding reading of the solo part in Robert Schumann's Piano Concerto, more than equal to the bravura of this well-loved work. Beethoven's Fifth Symphony is probably played less than it once was. Yet it is a revolutionary work, the composer incorporating instruments one then did not use in a symphony. This was an excellent performance of the work, less overwhelming than some, and the warmth of the hall acoustic showed off the contribution of the double bassoon to greater effect than that of the piccolo." "With his present great popularity and the current centenary of his death, it might be supposed that there would be much Mahler in coming concert programmes. However, this has not been the case. So it was pleasant to hear some of his less frequently played works in this varied concert by Knighton Chamber Orchestra under Paul Jenkins. Eight of his settings of the German folk poems Des Knaben Wunderhorn were fetchingly sung by soprano Nicola Bingham and baritone Harvey Nightingale. With a chamber orchestra the balance seemed richer and the varied colours of Mahler's orchestration were evident. Anyone familiar with Mahler's earlier symphonies will recognise some of these songs, which suffuse them. Robert Schumann had his bicentenary last month and it was a welcome treat to hear his Konzertstuck for Four Horns and Orchestra, another rarity. The four horns of Bardi Orchestra played the solo parts, in which Schumann contrasts them with a large orchestra. Again, the chamber dimensions and the warm acoustic handled the contrasts well , though the intimate location produced some unusual if not displeasing-balances because of the depth of the orchestral layout. Beethoven's Egmont Overture and Mozart's Prague Symphony completed the concert in fine performances, which tended towards a warm bottom-rich balance rather than brightness, the woodwind well to the fore against the strings." "Paul Jenkins thinks carefully about the works he performs, as was evident in this concert, comprising two contrasting concertos and a much-loved symphony. Each work had shape and a sense of direction, feeling that from first bar to last, the conductor had a distinct concept in mind. Malcolm Arnold's Flute Concerto No.2 has an unusual layout with two moderately paced outer movements flanking a central scherzo. Both Jenkins and the accomplished and perceptive soloist , Jo Conquest, captured the essential melancholy and tension of the piece, whilst giving full reign to the characteristic flashes of wit and optimism, especially in the finale. Although the Arnold produced the best playing of the evening, Haydn's Trumpet Concerto had tremendous spirit and vigour. Julie Bassett brought a sparkle to the solo part, matched by the alert and enthusiastic accompaniment. After an illuminating introduction by Richard Gill, the orchestra launched into a performance of Beethoven's Pastoral Symphony that unfolded with a natural sense of pace and phrase. The first movement's long crescendo was impeccably graded; the peasants danced with vigour and the storm section was vivid and dynamic. Just occasionally however, I felt the conductor could have relaxed his steadfast beat a little to allow the players a touch more expressive freedom. But this was a small quibble in what was undoubtedly an impressive achievement." "DRAMA and gentleness characterise the opening of Saint-Saens Concerto No.1 in A minor for Cello and Orchestra. Cello soloist Andrew Bound gave an exquisite performance; the cello sang with emotion, every phrase full of gentle drive and feeling. The piece wouldn't be complete without the support of a good orchestra -their punctuation was superb, their performance well regulated, fitting perfectly with the soloist. The final exciting bars of the piece were a wonderful culmination of a glorious performance by orchestra and soloist. The dramatic opening bars of Mendelssohn's Concerto No.1 in G minor for piano and orchestra indicated this quality performance would continue and so it did. 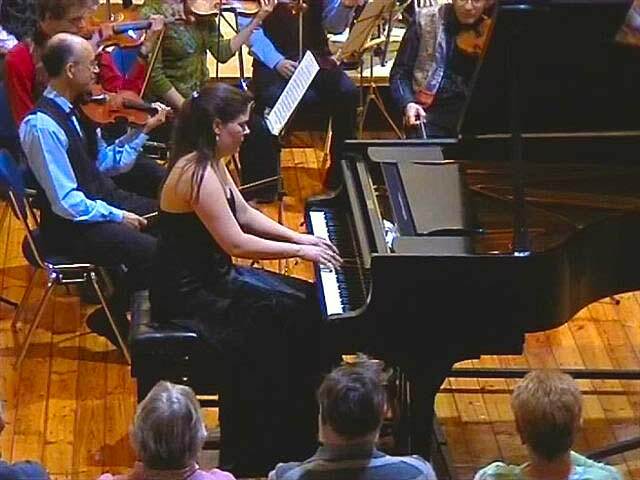 Piano soloist Samantha Ward gave a performance full of the emotional power that the piece deserves, while the orchestra played with vigour and drive. The gentle Andante was wonderfully interpreted, providing relaxation from the excitement of the outer movements. Mendelssohn's Symphony No.4 in A Major concluded the concert. Rooted in its Italian themes, it contrasted with the overt drama of the piano concerto. With the exception of just a few sour moments this was a highly effective performance which danced along and highlighted the many beautiful melodies. The Allegro Vivace and the final Presto were given particularly fine treatment. The Knighton seem to reach new heights of performance with every concert and are well deserving of the quality soloists which they accompany." "It hasn't taken long for the Knighton Chamber Orchestra to earn a reputation for fine performances and this concert was yet another example of why such esteem is so well deserved. With three excellent soloists, an imaginative programme and a truly impressive standard of playing and interpretation, it was an evening to remember. We began with Mozart's Violin Concerto No.4, with Shlomy Dobrinsky as soloist, in a performance that had a captivating blend of vitality and elegance. Dobrinsky produced, poised, sure-toned, playing that was equally effective in the bravura passages and intricate cadenzas of the outer movements as it was in the lyrical central Andante. Conductor Paul Jenkins was a sympathetic accompanist, drawing superbly balanced, rhythmically crisp, playing from the orchestra." Britten's haunting Serenade for tenor, horn and strings was given a remarkably compelling performance. Tenor Richard Roddis sang with impeccable diction and an instinctive feeling for the words. This, along with Mark Penny's admirably expressive horn playing and the conductor's musical insight, meticulous preparation and sure sense of style, kept us on the edge of our seats - spellbound by the composer's dazzling musical imagination. In Haydn's Oxford Symphony (introduced, like the Britten, in succinct and telling fashion by Richard Gill), Paul Jenkins produced a revealing and robust account that brought the notes leaping off the page. It was an effervescent reading that also showed just how much Beethoven owed to Haydn in its infectious combination of rhythmic vitality, humour and sensitivity. "A jewish legal rite perhaps wouldn't immediately be associated with a classical musical concert, but that is what Max Bruch's Kol Nidre is all about. Written for cello and orchestra, the piece may have a sombre feel, but is full of beauty; the melodious cello part, the swirl of the orchestra and the glissandi of the harp combine into a gentle and attractive piece. The performance communicated the melancholy and beauty of the work, with a rich cello solo from Ann Mee. Rodrigo's Fantasia Para un Gentilhombre introduced guitar soloist Yvonne Bloor who communicated well the Spanish origins of the piece. The opening Villano y Ricercare had a light initial feel, but could have benefited from more movement in its later stages.The second movement was beautifully lyrical, while the Axe Dance was rhythmic with a wonderfully restrained trumpet part. The Knighton Chamber and the music of Beethoven seem to work particularly well together. The Symphony No.3 in E flat Eroica had vibrancy, drama and intensity, flowing at a lively pace, and bringing the players into a cohesive force. The mental struggle of the composer, the anguish and the joy shone through in clear rhythms and melodies, dark harmonies and dramatic phrasing. There was a wonderful dialogue between woodwind and strings, shining brass and stunning percussion. It all combined to make this piece the highlight of the evening." 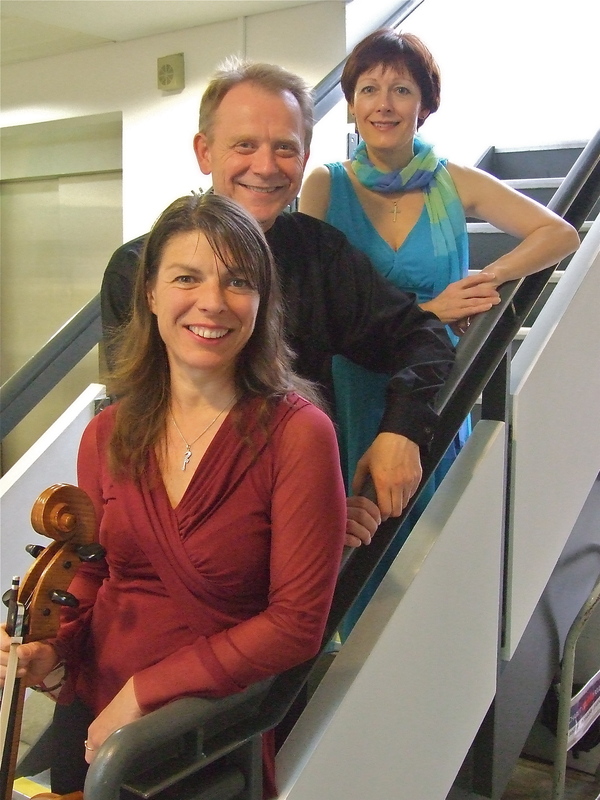 "MANY of our local musical groups show an admirably adventurous approach to programme planning, giving Leicester audiences the opportunity to enjoy attractive and unusual works that rarely get an airing. 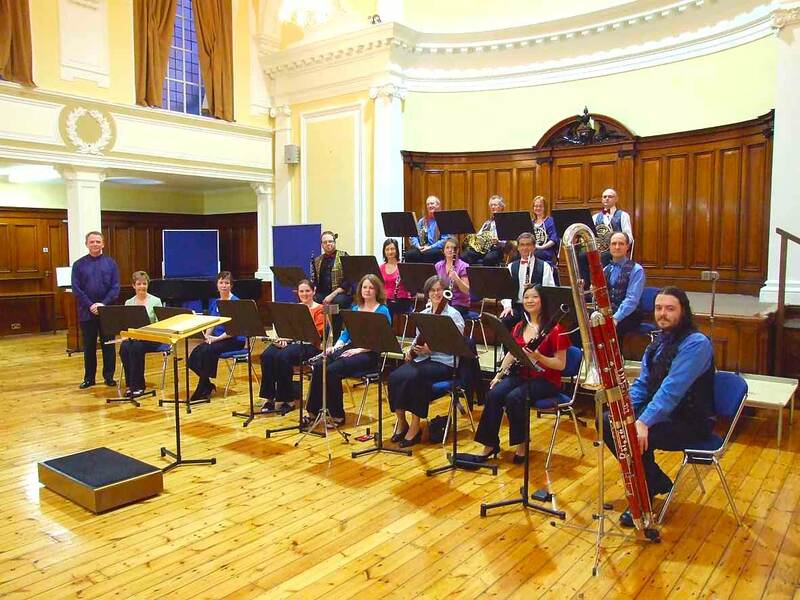 On this occasion, with the Knighton Chamber Orchestra, the rarity was the Symphony for Wind Instruments written in 1944 by the 80- year-old Richard Strauss and sub-titled The Happy Workshop. It is one of a number of glowing, richly-scored works from the composer's last years. This 45-minute, four movement symphony is opulent and intricate with an abundance of attractively lyrical themes. It repays careful listening and requires stamina on the part of the players, who, in this impressive account, rose splendidly to the occasion. Conductor Paul Jenkins had prepared meticulously and produced a well-balanced, integrated sound in his flowing, rhythmically agile performance. After the interval, Dvorak's Serenade for Wind, (with cello and double bass) provided the ideal dessert to the rich main course of the Strauss. With its appealing rustic charm and expressive beauty, the work is a model of balance and clarity. Jenkins and his orchestra revelled in the delightful melodies, producing a stylish, vivacious and affectionately phrased performance. The concert began with a song composed by Richard Strauss at the age of fourteen. Entitled The Alpenhorn, it was given a heartfelt performance by Rhiannon Jenkins (voice), Janet Edwards (piano) and Roger Swann (horn)." "AN ALL-BEETHOVEN concert began with the impact of the mighty Piano Concerto No.5 in E flat major. Known as the Emperor, piano and orchestra seem to compete throughout the piece this performance, while fool blooded, managed to keep a sense of balance. 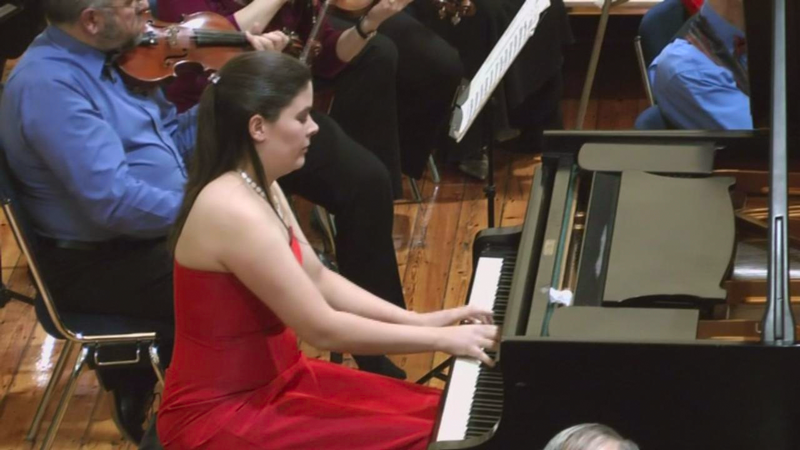 Pianist Samantha Ward gave a stunning performance full of clarity and emotion. Overall, this was a performance with impact, presence and excitement; conveying well Beethoven's dramatic composition. Like the piano concerto, Symphony No.7 in A major also has plenty of drama. Both works also have their gentle movements, so the level of drama didn't create a crisis. The opening movement had a sense of drive and excitement, while the dark romanticism of the Allegretto was beautifully conveyed. The lively final Allegro was undoubtedly one of the highlights of the performance. This was without doubt one of the best concerts I have heard the Knighton Chamber Orchestra give." "MOZART'S Concerto for two pianos in E flat major was written for the composer and his sister to play. So pianists Tor Bridge and Marguerite Beatson were stepping into illustrious shoes. They gave well- balanced , credible performances, while the overall effect was polished joy and exuberance. A lively and beautifully phrased Adagio Molto, with clear antiphony, opened Beethoven's Symphony No.2 in D major. The Adagio led to a simply sublime Larghetto with its wonderful variations. A lively Scherzo and an Allegro Molto concluded the symphony. The concert concluded with a performance of William Walton's Facade-An Entertainment. Poems by Edith Sitwell ,read by Lydia Hind and Roger Scoppie, punctuated an entertaining collection of dances, including hornpipe, tango and fox-trot. Saxophone and drums were added to the orchestra for a piece in which balancing voices and orchestra is the key to success. The Knighton Chamber Orchestra excelled themselves." "AN AMERICAN composer is coming to Leicester to attend a premier of his music. Californian Frank la Rocca will be present at the European premier of his work Veni Sancte Spiritus, performed by Leicester musicians Tessa Greenhalgh ,soprano, Robert Calow, clarinet, and Knighton Chamber Orchestra. The work will be performed at the University of Leicester's Fraser Noble Hall on Wednesday December 5th. Paul Jenkins, who will be conducting, said Veni Sancte Spiritus is known as the Golden Sequence from the Mass of Pentecost, in which Christians celebrate the descent of the Holy Spirit on the Apostles, 50 days after the resurrection of Christ. The music is very dreamlike and contemplative - quite the opposite of what we expect new music to be like. I think the Leicester audience will enjoy this opportunity to hear a work for the first time in Europe in the presence of one of America's leading composers." The programme will also include Mozart's Linz Symphony, The Lark Ascending, by Vaughan Williams with Leicester violinist Karen Silverwood, and Beethoven's Piano Concerto No.3 with pianist Francois Salignat, from London. 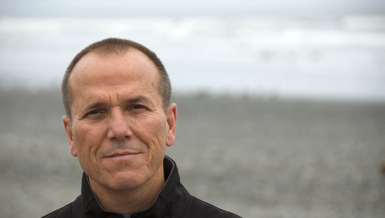 A student of music at Yale and Berkeley universities, la Rocca is now professor of music and chairman of the department at the East Bay campus of State University of California. "Knowing that the Richard Attenborough Centre does not have the most spacious dimensions, I was a little concerned as to how a chamber orchestra and an audience would squeeze in, never mind how the orchestra might sound. I need not have worried. True, the orchestra were close, indeed, so close that I could read the notes on the first violin's score, but the sound was wonderful. Not only was there a good blend, but the closeness brought a new clarity and dimension to the individual parts. Like a good studio recording, first the horns would come from the left, then the cello from the right, bass from the middle and so on. This was an exhilarating involvement which doesn't happen when an orchestra is placed at the opposite end of a hall. In Bach's Brandenburg Concerto No.4, the solo flutes sang delightfully, the violin embellished emphatically, while the orchestra and harpsichord provided a fine underlay to this wonderful carpet of sound. Mozart's Concerto for Bassoon in B flat major was joyful. A controlled performance by bassoon soloist Ceri Gough was nicely balanced by the orchestral accompaniment. 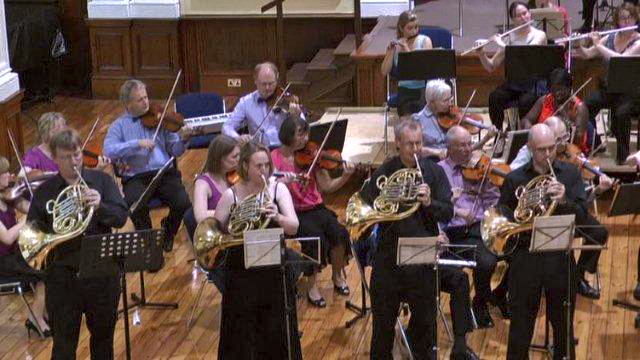 This performance of Symphony No.1 in C major was one of the finest I have heard by the Knighton Chamber Orchestra. It was exuberant, flowing and full of joyful energy." "The final concert of the orchestra's third season began with Mozart's Serenade for 13 Wind Instruments. Expertly performed by Roger Scoppie, a spoken introduction taken from Peter Shaffer's play Amadeus highlighted, with orchestral accompaniment, some of the musical detail from the Adagio. Seven movements of delicate interweaving and bold statement of themes followed. Many of the instruments had their own moment, fine performances by clarinet and oboe being particularly noteworthy. 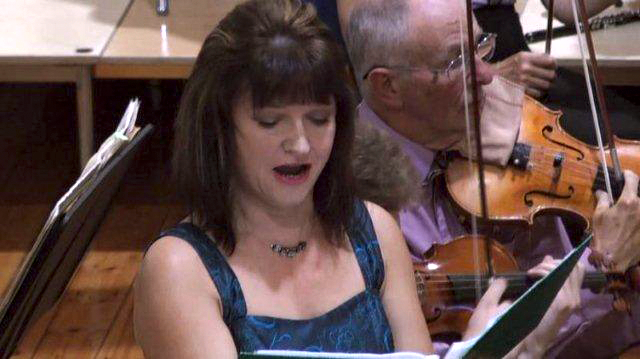 In Mozart's motet Exsultate Jubilate the heavens made music with soprano soloist Sandra Roberts, her refined tones blending well with the ensemble in this concerto-like piece with its joyful concluding allegro Alleluja. Tchaikovsky idolized Mozart and his music, so it was appropriate that his Serenade for Strings sat next to two pieces composed by his idol. This was, overall, a well controlled, but spirited performance of this elegantly romantic sounding serenade. 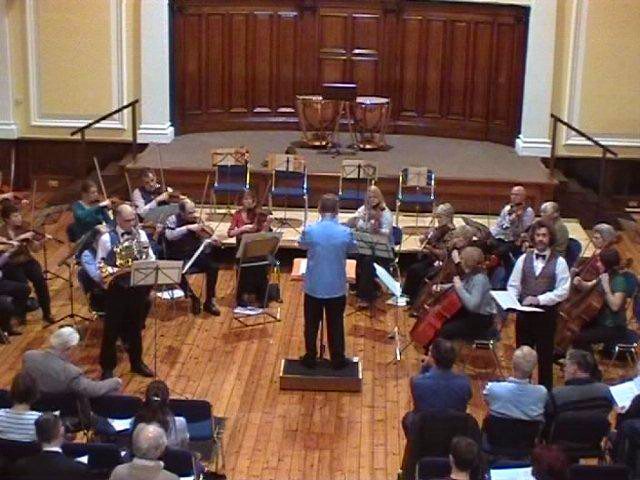 The intimate setting of the University of Leicester's Fraser Noble Hall for this concert added to the atmosphere. A nicely thought-out programme, a congenial setting and good programme notes added to a good performance. I look forward to hearing more from this developing orchestra in the future." "The concert began, appropriately, with an overture, this one being Rossini's Overture to The Italian Girl in Algiers. The version heard used trombone and percussion to give the piece a flavour of North Africa. The Allegro in Beethoven's Triple Concerto in C major opens in dark mode, breaking into romantic harmonies .The entry of soloists Karen Silverwood (violin) Rachael Calverley (cello) and Tor Bridge (piano) brought an immediate warmth to the piece. The soloists were clearly enjoying this performance. For Tor Bridge , it was the achievement of a lifetime ambition. The Mozart Symphony No.41 in C major, better known as the Jupiter, has so much to enjoy throughout. The easiest to enjoy was the Menuetto and Trio Allegretto, its graceful dance bringing to mind images of a ballroom of 1778 full of wigs, powder and elegant dancing. A small audience was treated to a fine evening's music." "As part of the Music at the University of Leicester series of concerts, the Knighton Chamber Orchestra, under the baton of Paul Jenkins, gave us a melodious programme. It included two works from the Classical era , Mozart and Haydn , and one from the Romantic era, namely Schubert. Mozart's Symphony No 25 in G minor began the programme. This was one of only two symphonies that Mozart wrote in a minor key and shows his more mature writing, with deeper emotions coming through. I felt that in this performance there was a certain staidness, lacking vivacity, but it was never the less enjoyable. 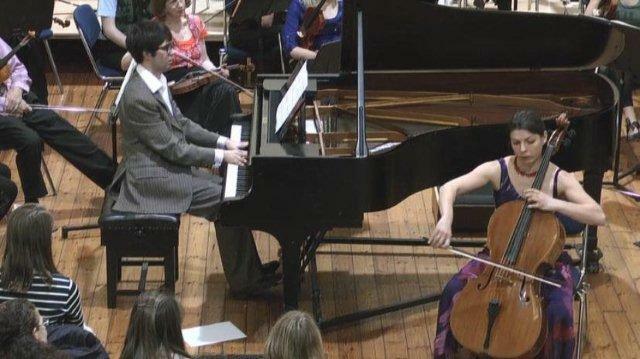 Rachael Calverley was the soloist in Haydn's Cello Concerto in C major. This manuscript had been lost until 1961 but is a work which needs to be heard. 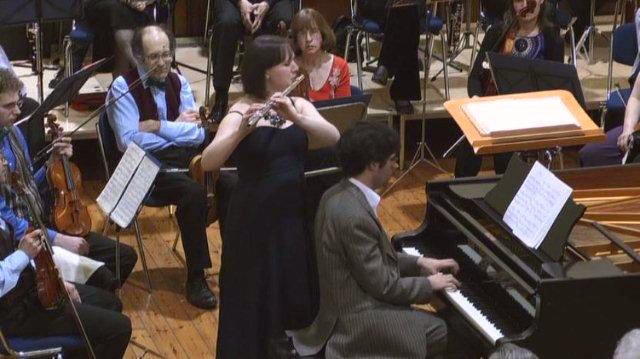 There is an elegance in the piece and Rachael Calverley gave us an excellent account, showing the rich tone of her instrument, the control of the Adagio and the dexterity required for the Allegro Molto. The orchestra came to the fore with Schubert's beautiful Symphony No 5 in B flat major. Schubert's romantic inimitable style is instantly recognizable and the lyricism, melody and orchestration carried through. The orchestra enjoyed this work. All in all, this proved to be an intimate, pleasant evening."